China’s state planner on Wednesday called for further advancement in the country’s $3.8 trillion digital economy, saying sectors such as big data and artificial intelligence will drive job creation. An intensifying trade war with the United States, China’s biggest trading partner, has obscured China’s medium-term growth outlook and spells uncertainty for millions of Chinese jobs. 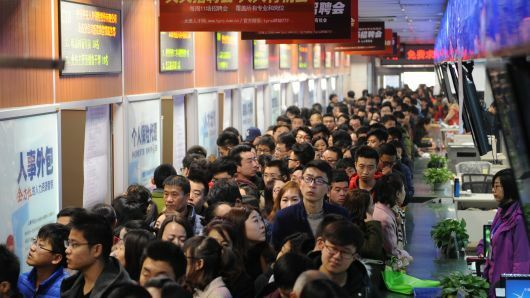 China’s state planner on Wednesday called for further advancement in the country’s $3.8 trillion digital economy, saying sectors such as big data and artificial intelligence will become drivers of job creation. The Chinese economy is in the midst of a long-term restructuring that has seen the decline of low-end industries and the emergence of higher-value factories that make robotics and drones. “China will promote the digital transformation of traditional sectors, driving more workers to switch jobs and improve the quality of employment,” the National Development and Reform Commission (NDRC) said. In recent months, Chinese government departments and agencies such as the state planner have been affirming their commitment to China’s long-term development, which Beijing sees as a means to rely less on trade and other external drivers. Chinese state media has accused Washington of using trade to suppress China’s development. China will make further inroads into areas such as the internet of things, big data, cloud computing and AI, and create more high-end jobs, the state planner said. The country will also actively attract foreign talent to promote the innovation of its digital economy, the NDRC said. China’s digital economy rose 18 percent to $3.8 trillion last year, equal to a third of the country’s gross domestic product , according to the China Academy of Information and Communications Technology. Hundreds of millions of Chinese people use mobile apps for social networking, entertainment, gaming and shopping. Urban China is also largely cashless, with mobile payments through Tencent’s WeChat and Alibaba’s Alipay the norm. The NDRC said it will also step up financing support to help grow new industries including drawing funds from capital markets. Earlier this month, it signed an agreement with China Development Bank, a major policy lender, to offer $14.55 billion in financial support for the digital push. Digital economy is also expected to help boost agriculture, as part of China’s ambition to revive rural areas, according to the NDRC.